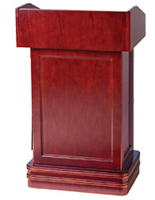 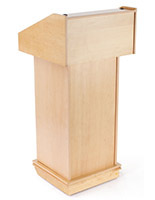 Want the classic look of the traditional wooden podium commonly found in public spaces, from churches and places of worship to auditoriums and press conferences? 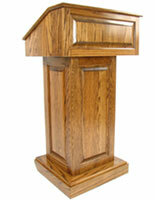 Wood pulpits have long been the ideal platform from which lectures, sermons, homilies, secular debates, keynotes and other speeches are presented. 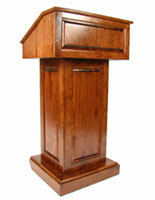 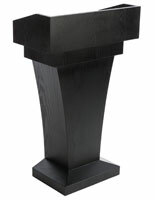 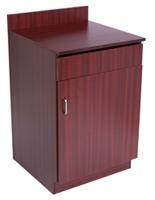 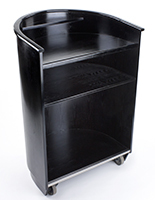 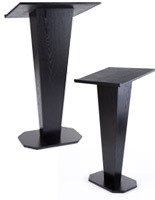 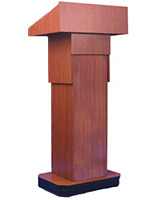 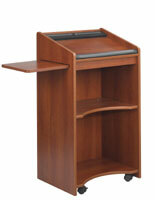 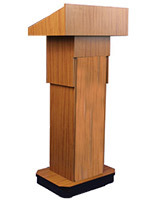 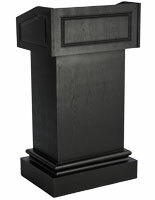 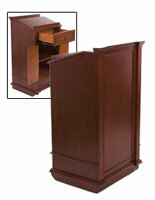 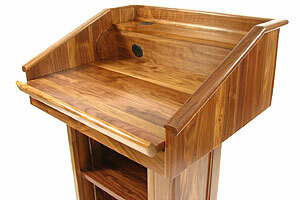 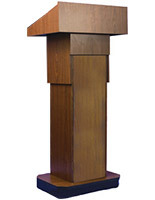 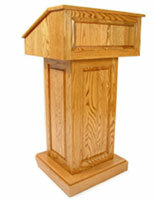 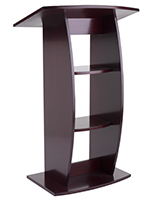 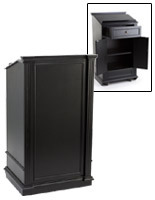 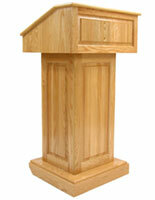 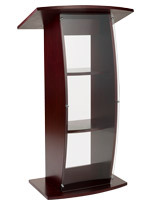 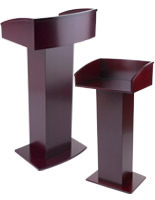 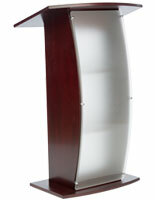 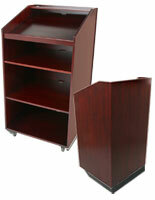 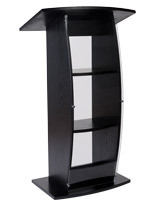 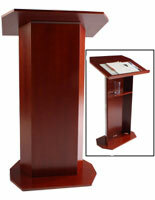 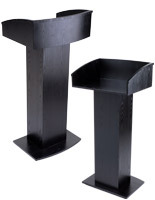 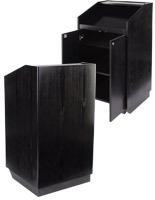 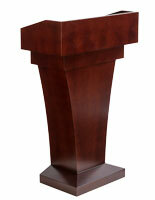 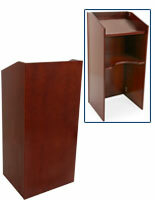 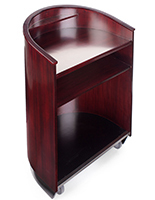 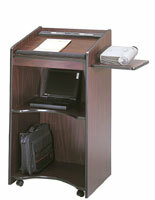 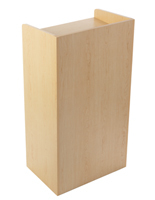 Podiums2go.com carries a full line of traditional wood lecterns. 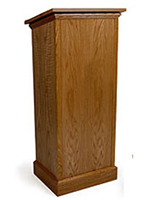 Our durable and stylish wooden podiums for public speaking, also known as wood finish presentation furniture, include plain styles without decoration as well as lecterns with crosses, ecumenical and religious symbols, and branded logos. 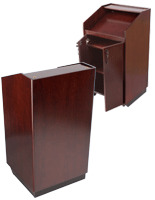 Our online collection features a large range of options and configurations, from solid wood lecterns to medium density fiberboard stands with rich veneer finishes in elegant, natural shades. 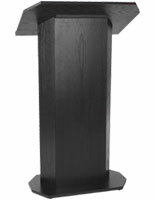 In either a religious or secular/commercial setting, it is important to make sure the wood lectern (sometimes spelled "lecturn") matches each location's decor or interior design scheme. 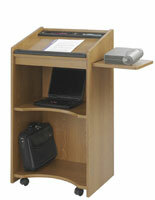 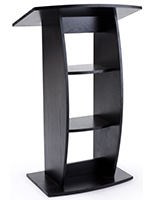 Educational and business applications are also suitable for these traditional reading stands. Our large selection of wooden podiums for sale includes full size and convertible models that offer elegance, style, and ease of use for any church, business, and school environment. 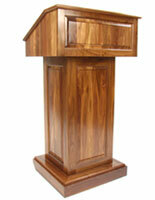 What makes a solid wood lectern different from a laminate or veneer pulpit? 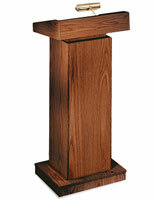 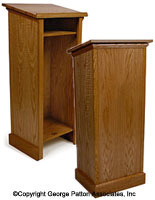 Wooden church podiums in natural finish colors are crafted from solid wood for a heavy-duty, long-lasting public speaking stand. 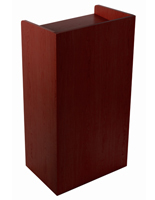 Thin, natural veneers in rich finish colors are then applied to the exterior to create an elegant, classic fixture. 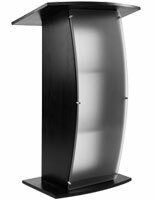 Veneered speakers stands feature the look of more expensive finishes while taking advantage of less expensive and lighter weight construction. 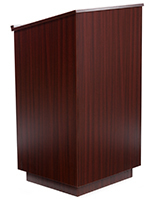 Laminate podiums in natural finish colors look very much the same as their solid wood counterparts, but can offer a significant savings over natural wood constructions. MDF, or medium density fiberboard, is one of the main engineered materials used to make these economy wood pulpits. 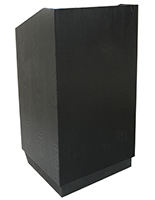 The pressed or composite construction is very lightweight yet offers increased durability and protection from scratches or damage as well. 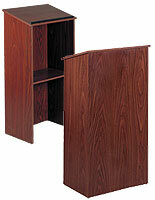 Like veneers, laminates are applied over the base substrate, which can be of either natural or manmade wood. 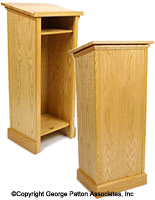 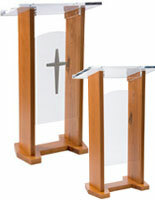 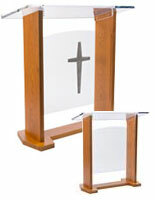 Freestanding wood church podiums and public speaking lecterns are available in fixed and convertible styles. 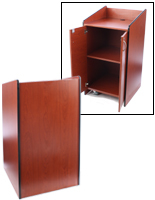 Many environments require fixtures that can change from countertop to floor-standing to accommodate different speakers and situations. 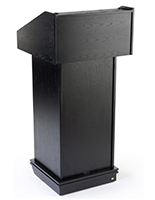 Many venues, such as auditoriums, schools, and conference and event halls, use convertible podiums instead of purchasing multiple lecterns in different configurations and sizes. 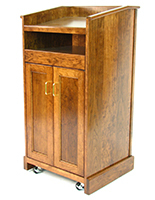 Other styles, especially the countertop models, feature folding assemblies that can be set up, taken down, and transported very easily. 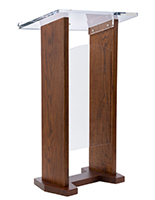 This type of fixture is an ideal way to present the look of a classic solid wood podium without the difficulties that can be involved in moving and storing full size lecterns. 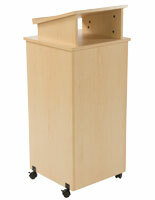 Some of our other lecterns with wood construction are adjustable. 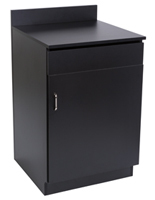 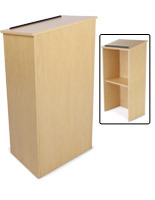 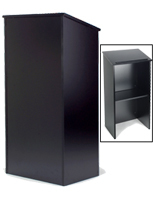 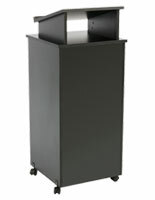 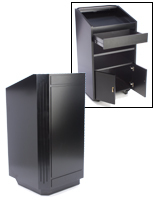 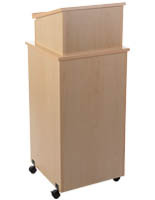 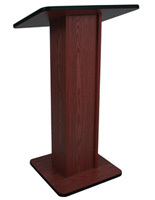 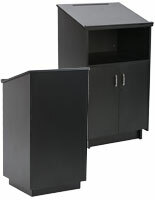 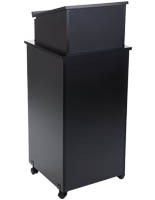 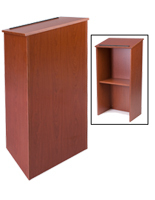 Height adjusting lectern surfaces offer an angled or slanted setup for speakers' reading notes and reference materials, and can be raised or lowered as needed. 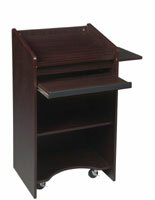 Each top has a lip or "book stop" that ensures papers stay in place. 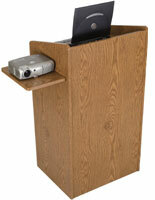 Professors or teachers frequently use laptop computers or tablets to supplement presentations, which can be done when the surface is in the flat position. 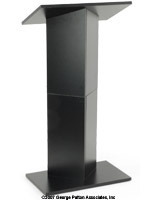 Some configurations are designed with additional multimedia hardware in mind, allowing a single fixture to function in many different capacities and accommodate many different accessories. 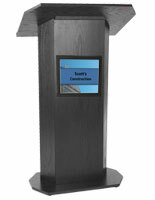 Public address lecterns are, by their nature, often the focal point of audience attention. 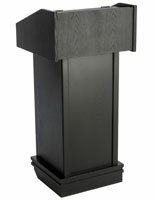 From the classic "Presidential" podium used for State of the Union addresses, public service announcements, and keynote and commencement speeches to a simple wood tabletop lectern on a trade show table, our commercial and church pulpits are designed to attract customers as well as for ease of use for presenters. 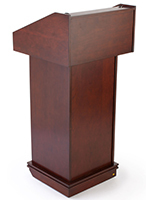 Many models are available with custom printing or decoration options that aid in speaker, facility, or business recognition. Integrated print and digital signage, carved crucifixes or crosses, and full-color logos are some of the many choices available.